The 550-mile Atlantic Coast Pipeline that is projected to run through the heart of Central Virginia has generated much political controversy and is now the subject of a new federal lawsuit. Although Governor McAuliffe has supported the pipeline, environmental groups and some landowners have been highly critical of the project. Environmental groups have started petitions opposing the pipeline and landowners have raised issues regarding the path of the pipeline and the ability of gas companies to enter and condemn private land for the pipeline. 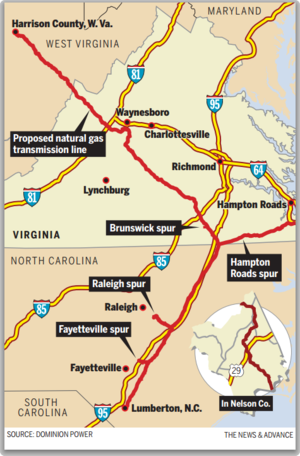 A recent lawsuit file in the Charlottesville Division of the Western District of Virginia seeks to declare unconstitutional a Virginia statute that allows gas companies the right to enter private property to survey the proposed path for the pipeline. The lawsuit challenges the statute as authorizing an unlawful taking for private purposes and a taking without just compensation in violation of both the United States Constitution and the newly strengthen provisions of the Virginia Constitution. As reported by the newspaper, Dominion says that it will not survey anyone's land without permission from the landowner or a court order affirming Dominion's right to survey.